The first thing we see is the ground. As the opening credits roll, water from our protagonist Cleo’s (Yalitza Aparicio) bucket washes over the tile, but we do not see her. The house is cleaned- it doesn’t matter how. The opening sequence of Roma pans through the house, taking it in longingly, forgetting the woman who flits from room to room, singing to herself. The house takes precedence, and the worker is erased. 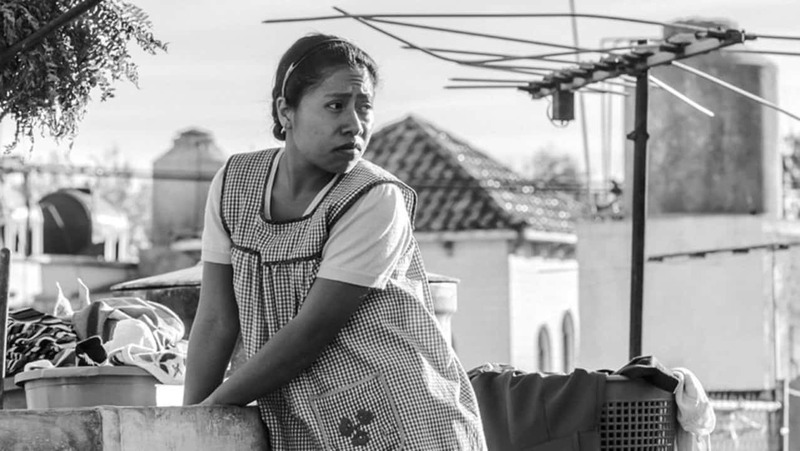 By the end of the film, Alfonso Cuarón will tell us he loved her – Roma was intended as a love letter, an imagining of what his childhood nanny’s life was like. But what did he love about her? Did he love that she was demure? Did he love that she was a hard worker? Or did he love that house, what it reminded him of, and the incidentals that made it- and his privileged childhood – what they were? 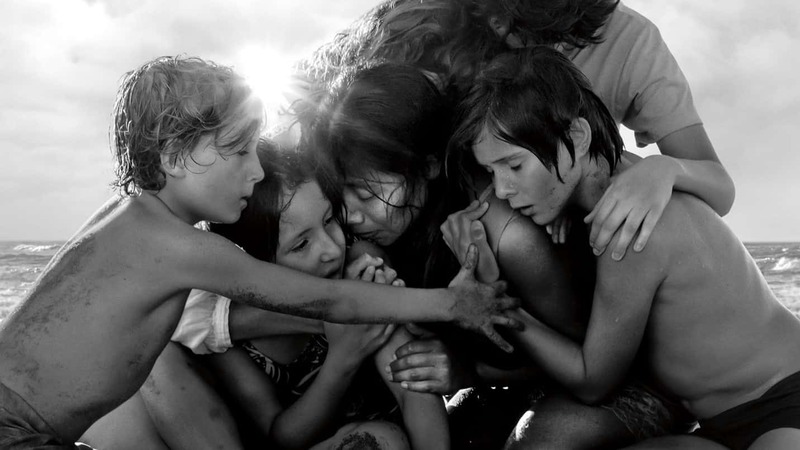 Roma isn’t a reckoning with privilege, and it knows it from the beginning. The cinematography, universally praised, doesn’t know what to choose. The house is beautiful. Cleo is sometimes part of it, sometimes not, but the house takes precedence. At times the film flirts with the turmoil of the Corpus Christi Massacre, a violent suppression of student activists in Mexico City, and that upset is meant to be reflected- I think- in the upset of the home, of Cleo’s doomed love affair with an aspiring militant, her ill-timed pregnancy, her employer’s – Cuarón’s mother, I suppose- philandering husband. But the Massacre takes up one scene, shot mostly through a furniture store window. Cuarón doesn’t want to leave his home, his family, or the things most familiar to him. As Roma moves forward, slowly, confidently, emptily, his unfamiliarity strangles the film, and what’s left feels like a studied, clinical depiction of a world Cuarón’s positionality makes him too afraid to actually see. Before the water from Cleo’s bucket is swallowed by the drain, it reveals, distorts, and reveals again a reflection of the sky above the tile. Shot in sumptuous black-and-white, there is an undoubtedly dreamy quality to the film – it’s a reflection, half-remembered, romanticized, even. Yet the majority of the film—its plot, its depiction of the city, even its most layered photography—comes off as strictly informational – the massacre scene, the architecture of the home, the forest fire Cuarón’s filmic extended family runs to stamp out. 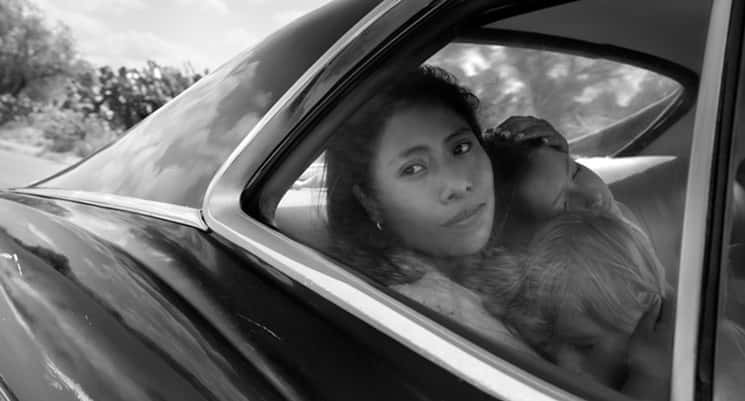 The final shot of Roma points to the sky hidden from us in the beginning. Maybe it was always just there. Maybe this is how Cuarón sees the truth. Roma is invested primarily in love and patriarchy. The first emerges from the city, the composition that screams “this is beautiful,” and from Cleo’s relationship with Cuarón’s mother and her children. The second comes from the relationship Cleo and the mother share with men- one of cruel and imminent separation. The two unite from this commonality, never fully acknowledging how patriarchy has separated the two hierarchically – Cleo is an indigenous woman, a laborer, and Cuarón’s mother is not. But he loves his mother, and he loves Cleo, and why can’t the movie have both? Love can’t erase oppression, especially when that love doesn’t limit the mother from yelling at her maid, or the children from their entitlement. The film depicts these behaviors, but it sees Cleo as a family member- so there was no discrimination. There are two maids working in the house throughout the film. Is the other one, who barely see, part of the family too? Roma disguises timidity as love, and power as virtue. The film looks quite beautiful, but it willfully hides a lot of ugly truths.